LAKEWOOD RANCH, Fla. (Dec. 5, 2016) - On the final day of the 2016 Development Academy Winter Showcase, Giovanni Reyna's first-half penalty kick was the difference in New York City FC U-15/16s 1-0 victory against Crew SC Academy Wolves on Monday morning at Premier Sports Campus. In the early minutes, New York's Thriston Briscoe laid a beautiful pass over the top for Will Sands. Sands would quickly bring the ball into the box only to play a square pass for Alexsi Morel who crept over to the middle, anticipating a possible rebound but instead getting rewarded for his field awareness. His shot would have gone in had it not been for a hustling Will Perkins who threw his body in front of the ball to bravely block the attempt. A big spark for Crew SC Wolves came in the 20th minute when Derick Broche slotted a ball to Kellan Landefeld along the left side of the box. Landefeld used his left foot to place a well-timed, low ball across the middle where Jack Beck was waiting to finish. NYCFC goalkeeper Alex Rando did well to anticipate the attempt and got the slightest of touches to push the ball out of reach from the onrushing NYCFC attacker. The scoreless drought was finally broken in the 25th minute by a NYCFC penalty kick taken by Giovanni Reyna, son of former U.S. Men's National Team captain and current NYCFC Technical Director Claudio Reyna. The penalty was set up with an attack that began with Veljko Petkovic, who swung the ball into the box, finding Briscoe before laying off perfectly near the penalty spot. Sands was able to beat the surrounding Crew SC defenders to the ball and earn the penalty as Wolves midfielder Alfredo Vivar's untimely challenged forced the center referee to point to the penalty spot. The second half would be more of the same from New York, continuing to develop offensive opportunities and keep the Wolves on their heels. Reyna especially would continue to create and distribute. In the end, the scoreboard remained the same as NYCFC closed out the 1-0 win. 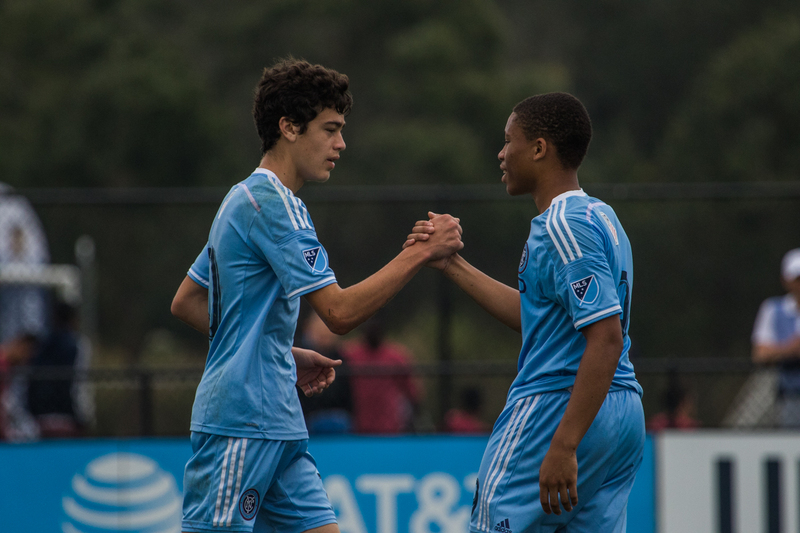 With the victory, NYCFC moves to 7-4-3 on the season while Crew SC Academy Wolves fall to 9-4-1.